Most surveyors are well aware that black-ash mortar causes wall tie corrosion. However, there are not many opportunities to see this as clearly demonstrated as it is in my video. I was fortunate to be asked to survey a property in Gargrave, North Yorkshire today. The pre-war semi, is constructed in a combination of sand lime mortar and black ash mortar. The ties in the property are well galvanised mild steel fishtails. There would normally be little variation the the condition of the ties, with perhaps slightly more advanced corrosion on the North West elevation. In this case, the ties in the lime/sand bed-joints are in brilliant condition, so good that the reflection of light from the boroscope nearly washes out the image. In the case of the black-ash sample; a tie which probably arrived on site in the same box, back in 1934, is in a very sorry state. 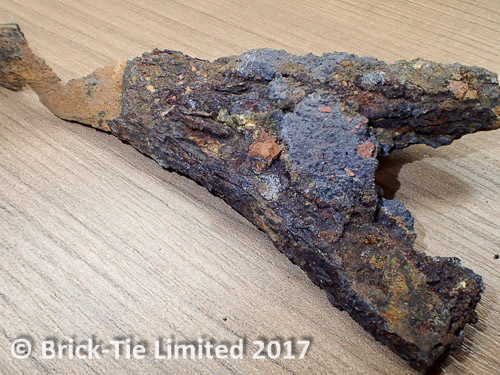 This is one of the best site examples of this type of corrosion; well galvanised ties being attacked only when they are in contact with damp black-ash. The video clearly shows how the corroded tie is in excellent condition on the remote side of the twist drip feature. Treatment in this case is structural isolation of the ties in the outer leaf and installation of resin bonded Helifix ties to the rear elevation. No remedial works are recommended to the stone sand/lime elevations. The good news is that I’ve already received an order for the remedial repairs.